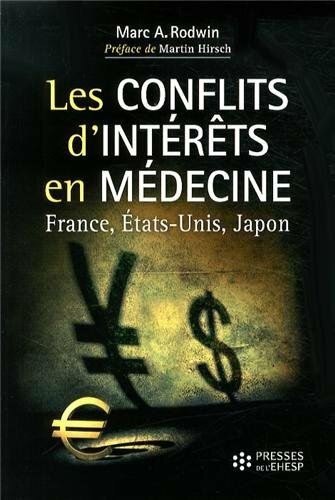 Dans son livre : Conflicts of Interest and the Future of Medicine: The United States, France and Japan, Mark A. Rodwin aborde la question des conflits d’intérêts (CI) des médecins en comparant les systèmes de soins de santé de ces trois pays. Son analyse perspicace lui permet de proposer des pistes de solutions s’appliquant aux principales situations de CI rencontrées dans la pratique médicale. In his book: Conflicts of Interest and the Future of Medicine: The United States, France and Japan, Mark A. Rodwin discusses the conflicts of interest (COI) of physicians by comparing the healthcare systems of these three countries. His insightful analysis allows him to propose possible solutions applicable to major COI situations encountered in medical practice.